The present Indian government had been working hard and in recent years it introduced the start-up culture in India. The government is also focusing on steps to improve India’s rank on the Index of Ease of Doing Business. This will help the government in generating employment, increasing tax revenue and increasing the GDP. Until now, the firms had to get MSME or SSI Registration done and now the government of India has made the whole process really simple by introducing Udyog Aadhaar MSME. Before the introduction of Udyog Aadhaar, the people had to file of EM – I and EM – II and this was all done manually. But now the investor can simply apply for Udyog Aadhaar through online medium. In this article, we have shared the steps of registering for the Udyog Aadhaar. Social Category – Proof required in case of SC, ST, and OBC. The first step of the registration process is to visit the website of Ministry of Micro, Small and Medium Enterprises. You can visit the site by clicking here. Alternatively, you can also copy and paste the following link in the address bar of your browser. 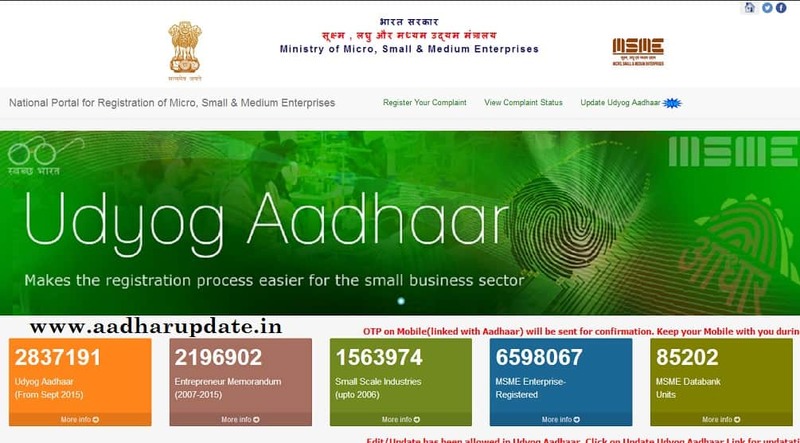 Link – http://udyogaadhaar.gov.in. Now scroll down and enter the Aadhaar Number in the given space. After entering the Aadhaar number, enter the name of the entrepreneur associated with the Aadhaar number and click on validate and generate OTP. You will receive an OTP on your mobile and you can use the same to proceed with the registration. In case you have not registered your mobile number with Aadhaar Card, you can also proceed with registration by clicking on the last option.This will load another page in new tab. Now on the registration page, enter all the personal details as well as the details of the business. You would also require entering Bank details along with NIC and DIC Code. Once all the details are entered, you can go ahead and verify the information entered by you. If the information entered is correct, you can click on submit button. This will generate another OTP on the mobile number registered. Enter the OTP in the designated space along with the captcha code. Now an acknowledgment receipt will be generated. The receipt will have an acknowledgment You can now save the receipt for future reference. Detailed information on filling the form is given on the home page of the form. In the case of any confusion, go through the detailed instruction guidelines on the homepage of the portal. We had applied for udyog adhar but not received same.